Wrapper: Nicaraguan Habana Criollo, Filler: Nicaraguan Habana, Binder: Nicaraguan Habana, Packaging: Full Wood Box. Full Bodied. The Antano is a Nicaraguan Puro made using extremely dark, oily and rich Nicaraguan Criollo wrapper from the Jalapa Valley. 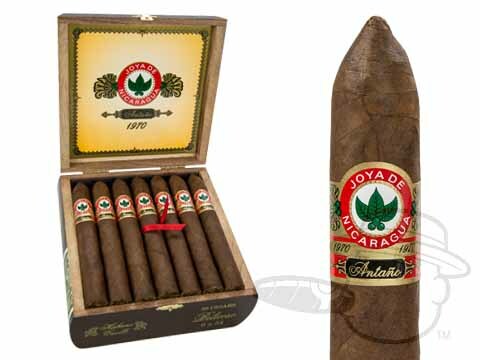 The classic Joya de Nicaragua cigar made way for their best selling line yet, the Joya de Nicaragua Antaño 1970. This full bodied cigar has it all, packing quite a punch, yet maintaining a smooth, spicy flavor throughout the entire smoke. Using a Nicaraguan Habana Criollo wrapper, and Nicaraguan Habano tobacco for the binder and filler, Joya de Nicaragua's powerhouse Antaño 1970 is fully loaded with unrelenting rich taste. Time and again, an easy, wonderful transaction and fresh, beautiful product. Love Best Cigar Prices! Fast, reliable delivery. Fresh cigars. Great prices. Extremely tasty full body cigar with a pepper flavor. Just finished one of these guys while wandering my yard and I was very happy with her. When I first picked this gal up, I notice it was very solid from end to end. Very dark wrapper, with a natural look. A few blemishes and spots but I prefer my cigars look like what they are made of! Toasted the head with some pine matches and on first taste I could feel how full it was. Very solid taste with almost a hint of graham crackers without the sweet. The wrapper wasn't spicy as I expected. She was tight the whole time I smoked it with a very even burn. I ashed it twice before I had to run in from the rain and the cap held together most of the way through and even then I didn't get any tobacco bits in my mouth. I assume this is a long filler as it's price tag is higher than my normal purchases. JOYA de Nicaragua Antano 1970 Belicoso is rated 4.9 out of 5 based on 7 customer ratings.